This is the last post about it, promise! All the code, scripts and database schema can be checked out and cloned from the Github repo. We’re approaching the end, probably a relief to some I know but well done for hanging in there through all seven parts. There’s one more small thing I want to show you before I call time on this blogged out tutorial. Hardly exciting I know but if you think about it this is the only thing that’s missing, reporting the results. As Python is already installed on most Pi distros it makes sense to use that to knock up a quick webserver than install Apache and PHP and all that jazz. The Bottle WebServer framework lets us cook up a webserver real quick. And as the Sqlite3 libraries are built in we’re already half way done on the hard work. All we need to do is knock up a quick script to pull the recent sentiment scores and show them, nothing more than that. You can download the code from here. sql = "SELECT * FROM twitterdata ORDER BY rowId DESC limit 50"
Pretty trivial. Once you get it running with python webserver.py you can call the page and see the output. 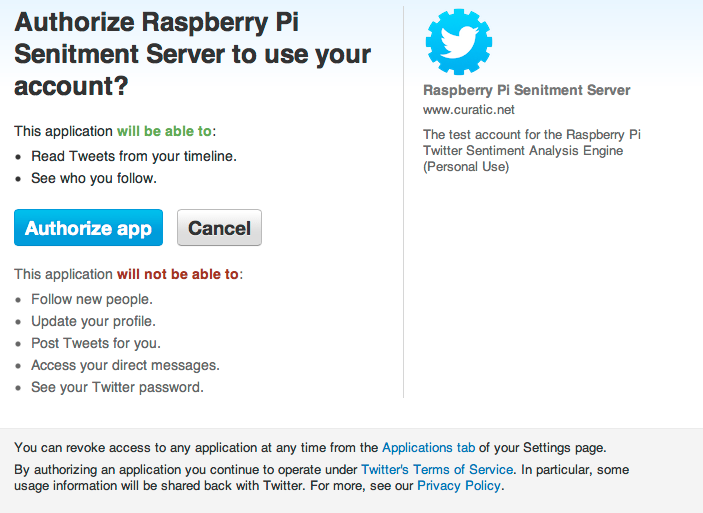 So in seven parts we’ve covered the basics of sentiment analysis, connecting to Twitter with OAuth and R, saved to Sqlite3 and also put together a quick and dirty web server to report. There are a few improvements you could make…. The database doesn’t have a column for the date/time of the tweet though the dataframe in R will have it there. No big deal but if you wanted to plot peaks of hashtags then it becomes a big deal, you need the date/time in there. Observation of the current status of your API rate limit is very important. You don’t want to get black listed as a bad citizen of Twitter API users. No, no, no…. There are functions in the R Twitter library to see the status of the rate limits based on your credentials. Yeah the search isn’t the most robust, it’s a basic search. The searchTwitter method in the R Twitter library will take a Tweet ID and search forward from there. This would mean no repeats in the database either. Remember it’s only a small machine and when R is doing its sentiment thang the CPU takes a beating, usually topping 98% utilisation. The memory fairs better. This is worth keeping in mind with the frequency of the cron job, in the tutorial I set it to every ten minutes. 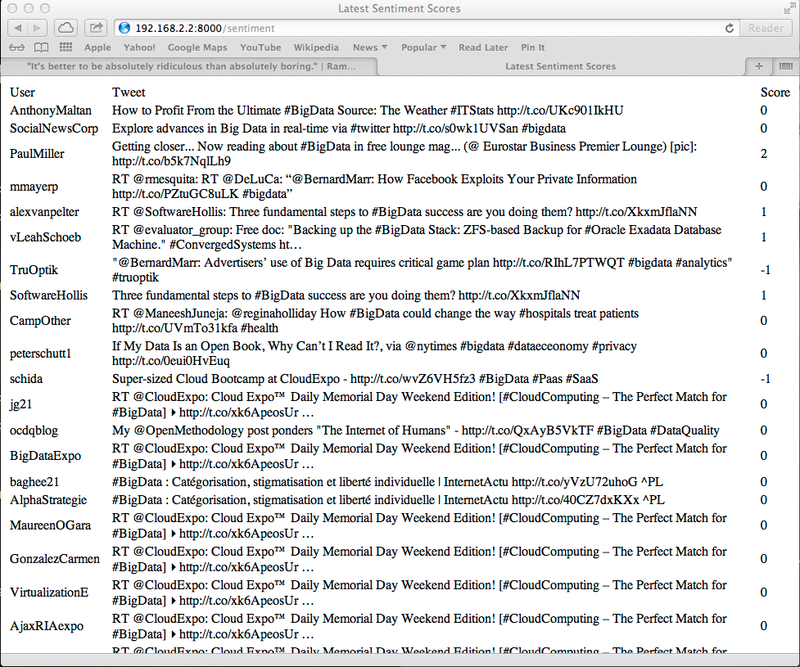 That gives R chance to pull the tweets, get the sentiment and save to the database then get it’s breath back. It’s all about experimenting with what works best but remember it’s only a small machine. So we’ve run all our segments of code within R console. For this to work properly, unaided, we have to put some scripts in place. I’ve amended all the files to run from the command line in one easy go. A few things we need to keep in mind. Firstly the Raspberry Pi is a small device so it doesn’t like to be punished too much. Also we need to be mindful of Twitter’s API rate limit. Search will be rate limited at 180 queries per 15 minute window for the time being, but we may adjust that over time. A friendly reminder that search queries will need to be authenticated in version 1.1. It all depends on your needs at the end of the day. Assuming that the code, credentials and database are in a directory called rpisentiment all should be well. And this will fire up R, do the search, sentiment and database storage. Then gracefully exit. Lovely. From the early days of Unix Cron still confounds and amaze. Once you know the basics then it’s not too bad. So we want our script to run every 10 minutes, this doesn’t overload the Pi, gives R plenty of time to get through the results and it keeps the Twitter rate limit happy too. All this is up to you to change for your searching requirements though. What’s happening is we’re instructing our runner.sh file to run every ten minutes. For more details on cron have a look at the man page or the page on Wikipedia. You can see any problems or progress in the rpisentiment.log file, any output created goes there. You can download ALL the required files and scripts here. So with all these elements floating about it would be nice to bring it all into some form of order. Now assuming we want to run this regularly, every hour for example, it would be good to have everything in a file to run in one go. First there’s a little housekeeping to do. The RTwitterUtils.r file had a function with no code in it, this was SaveTweetToDB(). So, what we want is for this method to take all the elements we need and insert it into the database. We know there are the following: a twitter id, a username, the tweet and a sentiment score. So assuming that we have a database connection we can send data to the SQLite3 database to be store, we’re using the sentiment method from Part 4 to get the score. This just stores it all for us. I’m sure there are neater ways to get this in but it works as a rough and ready prototype. There we have it, the elements of a system. Plenty of scope for improvement and I’m already thinking of the amends I could make but regardless let’s get it working first. We need a R script to pull this all together so the Pi only need run one thing. So a new file with the following will do everything we need it to, pull the data, score it and save it all to the database. Firstly load the source for the exsting RTwitterUtils.r script, this will expose all the methods for database connections, scoring and saving. Load in the positive and negative word sets into memory. Then we pull search term into a dataframe. Open up a database connection to SQLite3 and then iterate through each row of the data frame, getting the sentiment score and if all is okay saving the results to the database. From the command line you can see your work in action. 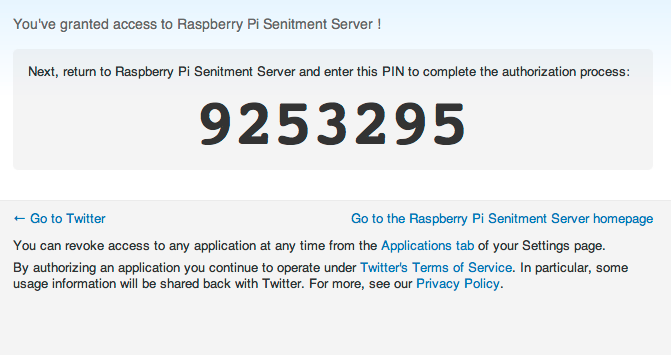 And you’ll get the results with the sentiment scores. Now this is only a starting point. We’ve got the basics down. Part 6 is going to be about using Cron to do the task regularly and we’ll introduce some Python web basics to make it all a little more presentable. Now all the prerequisites are in place we can now turn our thoughts on to the sentiment itself. Basic sentiment is pretty easy to do so and I’ve put the barebones of what you’ll need in a Dropbox folder so you can have a look on it. To improve on it won’t be that difficult. The principle is to take the text of the tweet and run each word though a scoring routine. This routine has positive and negative words in two separate arrays. Running through each word of the tweet if a positive word is matched then the positive score is increased, likewise if a negative word is found then the negative score is increased. The final sentiment score sent back is the positive score minus the negative score. Now for most people’s needs that is more than enough, it gives us the basics. There’s plenty more scope where that came from…. but for now let’s work on this. The words come from word lists which are stored as text files. So it’s a case of loading these into memory first. So I have a function to load in each set and return an array of words. The same happens for the negative words. Finally for this post is the routine that will calculate the score. What’s happening here is quite basic but I’ll explain all the same. First job is to clean up the sentence text so punctuation and control characters are removed. Digits get taken out too as they are no use to us in this exercise. Then the sentence is converted into lower case. The word list is split up in to an array of words and then we look for matches of postive and negative words against this newly created word array. The final job is to count up the positive and negative counts where a word has matched. What’s returned back is the pos score minus the neg score. We can test what’s been written so far in R. Assuming the .r file has been read in with source() command. First we load in the positive words. So we have 2006 positive words and 4783 negative words loaded. By using the GetScore method we can get a score now on some text, we can make some up to test. So here’s a positive one. This gave us a score of 1, so it’s positive. Let’s try a negative…. Now we see how the negative one faired with a score of -3. Bad, bad and horrible being the culprits there. Okay, so here’s the issue that you need to take into account. The above doesn’t measure false positives. So if something came up like, “yeah man, he’s sick on the skateboard!”, means something to one group of people and something else to another. The sentiment here would be negative (triggered on the word “sick”) even though the proper sentiment of the sentence is positive. No one really writes, “By jove! He’s really good on that plank with wheels!”. Time to start processing in volume. Working on pulling many tweets, getting the score and storing it all in the database and put all our code in some logical form of order. In the meantime you can look at the files for the R code, the positive word set and the negative word set. You’ve probably noticed I’m doing the walkthrough in bit sized pieces, two reasons. Firstly time, to code, investigate and then write up what you’re doing can take time. A labour of love I know and I do enjoy doing it. Secondly I personally think it’s easier to learn in small segments. If I posted a huge start-to-finish project it’s harder to learn. So, Part 3. Sqlite3 and R.
On your Pi log in and then sudo su so you are the root user. Now we’re going to install the Sqlite3 database command line client. It will download some things and get them installed. We need a database to hold our tweets but also have a column for a sentiment score. This will become more clear later on when we start saving twitter data from R into the database. For now though let’s just create the required table so we have it for later. It’s the basic of the basic but it suits our needs here. An easy way to check all is well is to run sqlite3 and run the .tables command. It might take some time to build and compile so be patient. The basic code to connect to our database from R is fairly trivial. We’ve got the fair guts of what we need to retrieve and store tweets. Next time we turn our attention to coding in R the storing of tweets and getting the sentiment. I’m sure the BigData die hards will be turning in their silos as I speak…. but let’s carry on. 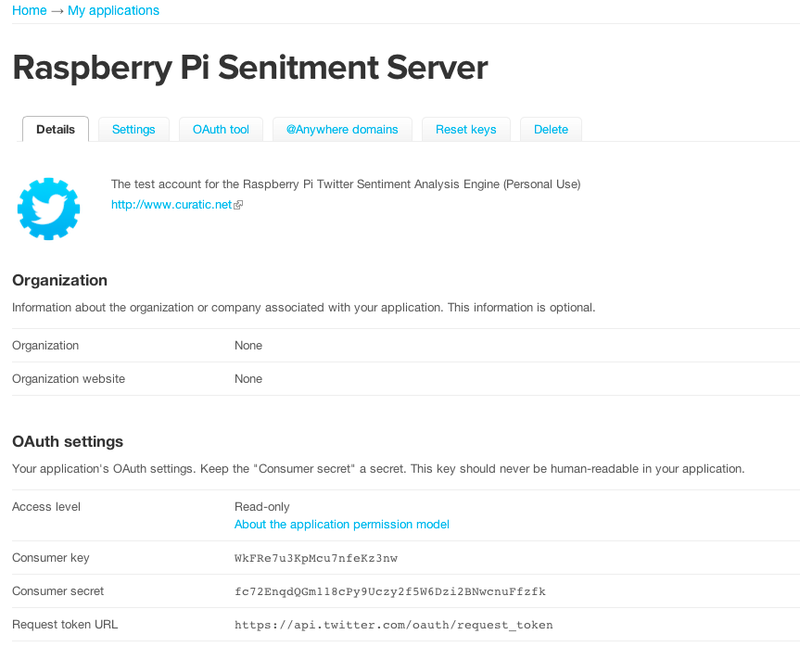 With the work I’m doing on the Raspberry Pi Twitter Sentiment Server I thought it might be a good idea to utilise existing code to extract hashtags and mention data. I’ve covered this a lot in the past with various Hadoop demos, talks and presentations. 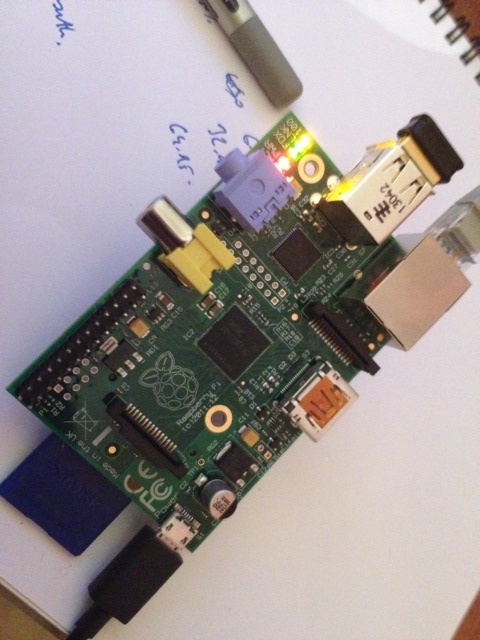 I’ve put together a small project called Pidoop which is the Surgeon/Hadoop distro for the Raspberry Pi. And first tests it’s working well. * There is no celebrity gossip. One of the drags with Twitter API is the OAuth system. For the web application types it’s no big deal too-ing and fro-ing between servers. For command line things like this, it’s a pain. This pain seems to be show mostly on StackOverflow with a bunch on enquiries on the struggles of getting R/TwitteR/ROAuth working. A good thing though is that the ROAuth package has been updated to make things easier so it’s not a completely wretched thing like it once was. Firstly you’ll have to log into dev.twitter.com and create a new application. I’m only bothered about read only access to tweets and not interested in following new folk, sending direct messages or anything like that. There is NO callback URL required. We’re doing this manually so we don’t need redirecting anywhere. The “Sign In With Twitter” option is checked. This generates the PIN code we’ll need to confirm our OAuth verification in the R application. Make a note of the ConsumerKey and ConsumerSecret settings as you’ll need those for the following R script. Replace the consumer key and secret values with the ones you’ve written down from your own Twitter application. Back to your R script now type in the PIN code and press return. You should return to the R prompt (>). Just to make sure everything is working run a quick search test. And you should see some output. "eriksmits: #BigData could generate millions of new jobs http://t.co/w1FGdxjBI9 via @FortuneMagazine, is a Java Hadoop developer key for creating value?" "MobileBIAus: RT @BI_Television: RT @DavidAFrankel: Big Data Collides with Market Research http://t.co/M36yXMWJbg #bigdata #analytics"
 "alibaba_aus: @PracticalEcomm discusses how the use of #BigData can combat #ecommerce fraud http://t.co/fmd9m0wWeH"
 "alankayvr: RT @ventanaresearch: It's not too late! Join us in S.F. for the 2013 Technology Leadership Summit - sessions on #BigData #Cloud &amp; more http…"
 "DelrayMom: MT @Loyalty360: White Paper 6 #Tips for turning #BigData into key #insights, http://t.co/yuNRWxzXfZ, @SAS, #mktg #data #contentmarketing"
Saving this file saves a lot of headache of constantly going through the above process to get authorisation. Once saved it’s a case of loading the file and registering it as Twitter OAuth credentials. So that’s a lot of the required work done to get the authentication done. Next time we can start pulling in, storing and making some sentiment of the data. One of the most read blog posts I’ve done was “Twitter sentiment analysis in 30 seconds” and it’s still one of the most used search terms. There was a reason I named the blog after a Marilyn Monroe quote, software and data are never perfect. It’s an imperfect medium. The curious nature of developers means that folk will think of you as mad from time to time, that’s okay with me. So, I have a Raspberry Pi with the standard Raspian Wheezy distro on it. Now I’ve been pondering a dozen ideas but this seems a fun one to do for the sake of the blog, kudos and general mucking around. It is better to be ridiculous than boring…. Assuming you have the basic OS installed and a connection to the internet. I wired my direct to my MacBook Pro with a standard ethernet cable then I can ssh in from the terminal. First things first I want R to use the Twitter library to pull in the results of a Twitter search. Using a modified version of the sentiment analysis R script then figure out whether a tweet is positive or negative in sentiment. Another requirement is to store the most recent tweet ID somewhere so on the next run we only pick up tweets from that point onwards. We’ll use cron to schedule R to run the script on a regular basis. So, in this part we’ll just get the basics of everything installed. There’s a few bits we need to install before we think about the Twitter library. You’ll need libcurl4-gnutls-dev and libcurl4-openssl-dev installed as R/Twitter library require RCurl and ROauth to be installed. Next we install R itself, we only need the base install. Now we can open R and install the Twitter library. This will then give us the R shell. This will load in the required libraries ready for use. Now since the original blog post the Twitter library now follows Twitter’s API 1.1 which means that most requests will need OAuth authentication. So that’s the next job but I’m saving that for the next part of the series. Putting the Teradata, IBM’s and everyone large scale aside for one minute. I’m not saying they don’t have a place in all of this, they do. Cluster farms and huge data silos are out of reach to the common man in most cases. For the rest of us there’s the joys of single nodes, one machine doing all the work. Now dumping petabytes of data on a single drive is not a common thing to do. And to be honest I’m not overly interested in the outliers and the black swans of this world, well not yet. The planning stage for this data project or any other startup for that matter starts with the basics. A back of a beer mat job (well you normally have to split the beermat in two but that’s just a technicality). Back of the envelope (BOTE) calculations have gone on for years. Sometimes known as Fermi Questions from the physicist Enrico Fermi who was roughly calculating bomb blast waves. The key word here is “roughly”, you can filter out an awful lot of noise with a basic rough idea. If you remember the app economy equation I posted last month this is essentially a back of the envelope calculation. It gives me a rough idea, it’s not polished but it’s a good starting point. The belief that BigData starts with taking everything and seeing what transpires is wrong in my eyes. Unless you have the processing power, the time and the patience to wait for some mysterious answer to arrive, then you’re usually already having an idea what you’re looking for. Why go through the whole lot? The problem with BigData is there’s no one story that fits all. Every investigation starts with a question and with the data derives an answer. It may not be the answer you want, nor correct but it’s an answer. I’m becoming a firm believe of recency over historical especially for the likes of loyalty data.